A Premier League classic lit up a Sunday afternoon in Liverpool, as Jurgen Klopp’s side ended Pep Guardiola’s unbeaten start to the season in sensational fashion at Anfield. Leroy Sane’s thundering near-post shot brought Manchester City level late in the first half, cancelling out Alex Oxlade-Chamberlain’s superb early effort. But three exquisite strikes in nine dramatic second-half minutes, from Roberto Firmino, Sadio Mane and Mo Salah, were (just about) enough to secure the three points for Liverpool. City never stopped driving forward, however, with late goals from Bernardo Silva and Ilkay Gundogan creating yet another nervy finale at Anfield. Liverpool started in a 4-3-3 formation, dropping back to 4-5-1 in defence, with Jurgen Klopp opting to reinforce his midfield. 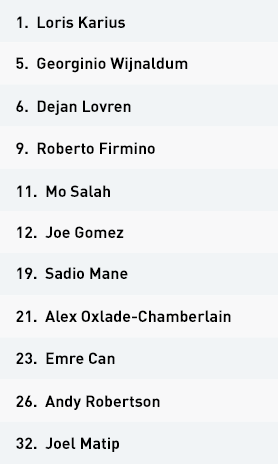 Emre Can played as a holding midfielder, flanked by Georginio Wijnaldum and Alex Oxlade-Chamberlain, while Sadio Mane and Mohamed Salah operated down the wings. 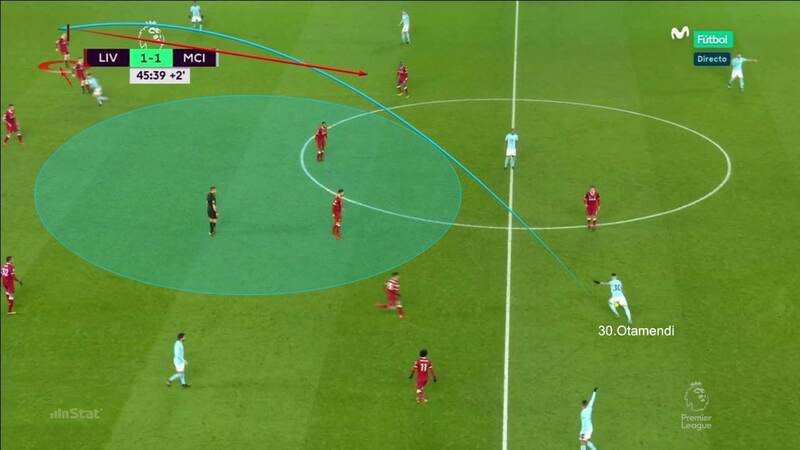 The main objective of the Liverpool frontline was to force Ederson to look for direct balls into the three Man City forwards, where their back four was set up to control any aerial threat. 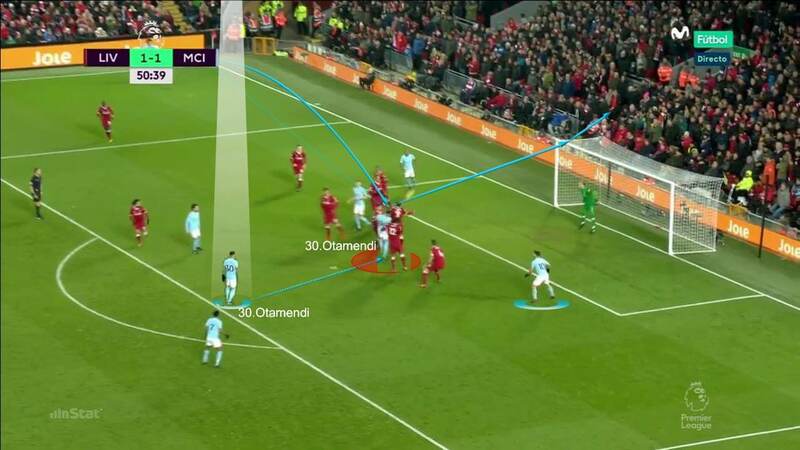 If the goalkeeper did try to go short to his centre-backs, Liverpool pressed them towards the central channel, where they tried to block the route to Fernandinho. Roberto Firmino was the key man here, tasked as he was with marking the Brazilian midfielder out of the game. 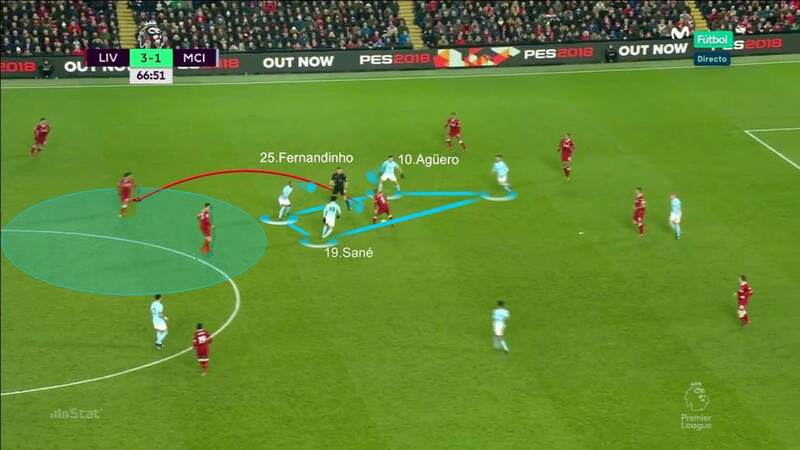 The Reds also tried to prevent the City midfielders from linking up with their forwards, forcing them to play backwards and then piling the pressure on the player in possession. Can and Wijnaldum stood out in particular here, organising the defensive effort and ensuring the league leaders were not as dominant as usual. 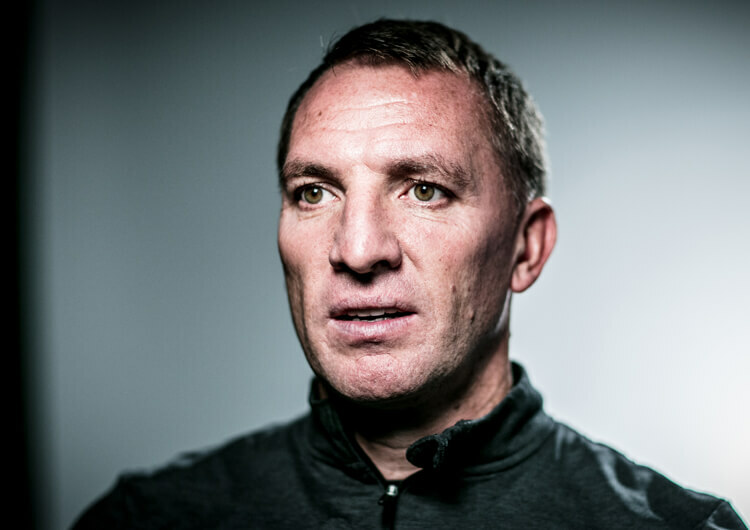 The Liverpool back four remained tight in the defensive third, although they relaxed in the final few minutes, allowing the visitors to play through balls in behind Andy Robertson in particular. Both late goals resulted from Robertson’s isolation at left-back. Liverpool were lethal on the counter-attack. The speed of the first wave of their breaks meant they escaped concerted pressure from Man City. 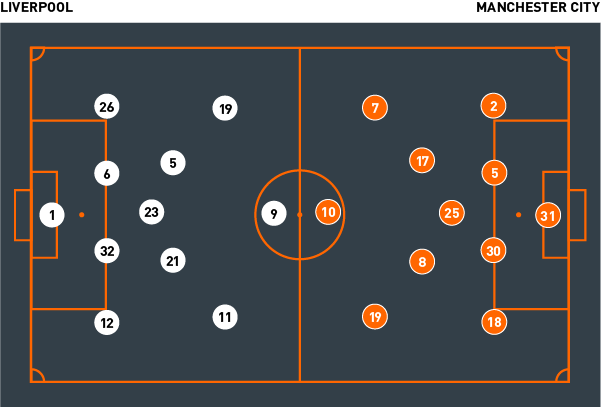 Their attackers surged forwards, positioning themselves in behind the line of pressure ahead of the ball, thus providing the player who won the ball plenty of possession. Alex Oxlade-Chamberlain was the standout player in these situations; he showed an impressive understanding of when and where to attack the free space both with and without the ball. The Reds liked to vary their approach in attack, alternating between direct play and passing through the thirds. Loris Karius often looked to move the ball into the opposition half as quickly as possible, while the midfield showed plenty of attacking intent in the middle of the park, constantly seeking to exploit any gaps in behind their opposing midfielders. Oxlade-Chamberlain made particularly good use of the space on the inside, projecting his side forwards in attack where they tried to outnumber Fernandinho. As a collective, Liverpool were well balanced. In the final third they managed to locate their biggest threats in prime positions, where they caused constant uncertainty in the last line of defence. Salah, Mane and Firmino regularly found openings, successfully exploiting the space in between the centre-backs and the full-backs alongside them. In the defensive transition, they reorganised quickly and effectively after losing the ball, Wijnaldum and Can leading the way in swarming around the man in possession. They generally stopped Man City from outnumbering them in this phase of the game, reducing the threat of the counter-attack. Liverpool started in a 4-3-3 formation, dropping back to 4-5-1 in defence, with Jurgen Klopp opting to strengthen in midfield. Emre Can played in the holding role, flanked by Georginio Wijnaldum and Alex Oxlade-Chamberlain, while Sadio Mane and Mo Salah operated down the wings. Liverpool forced Man City to play long into their forwards. 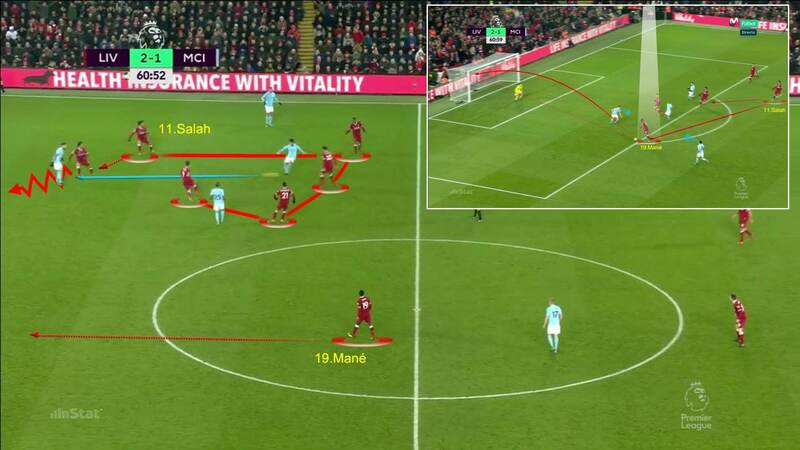 This image shows how Mane and Salah in particular were positioned to close down a number of shorter options available to Ederson. Liverpool tried to press City towards the central channel, where they tried to block passes to Fernandinho. 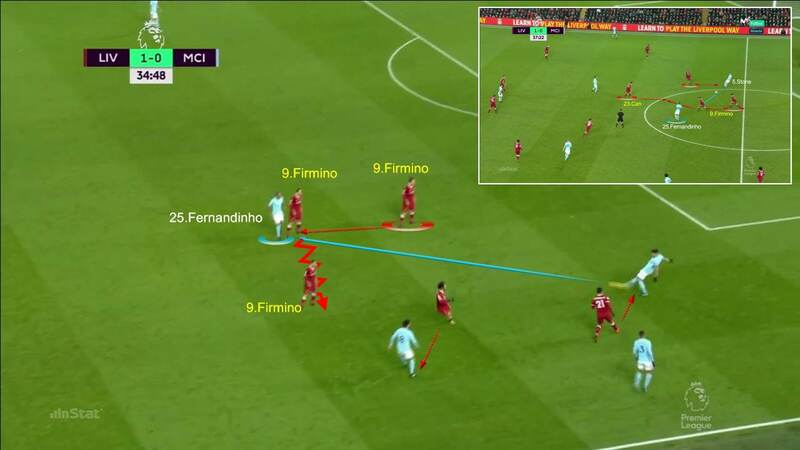 The excellent Roberto Firmino was the linchpin of this tactic, as the player tasked with marking the Brazilian central midfielder out of the game. Liverpool were at their best on the counter-attack. They showed plenty of attacking intent and looked to penetrate the empty space in behind the last line of defence. Here, Oxlade-Chamberlain beats the first line of pressure to set up Firmino, who outguns John Stones to make it 2-1. 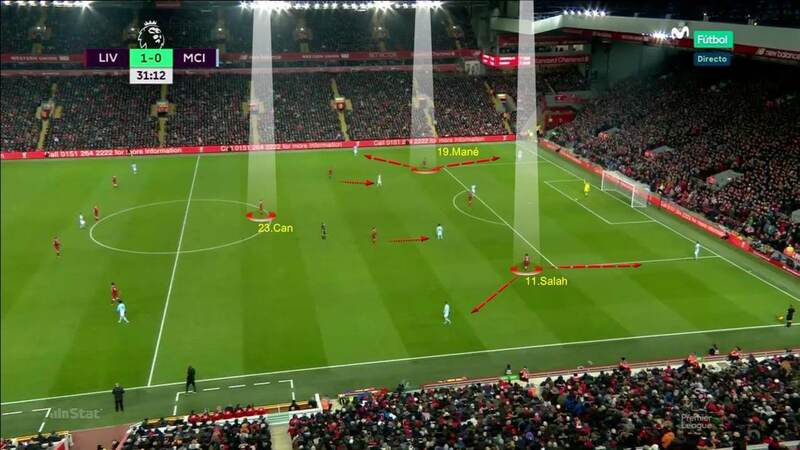 The Reds tried to prevent the Man City midfield from linking up with their forwards, forcing them to play backwards and then piling the pressure on the player in possession. Here, Salah intercepts the pass and uses his speed to break through the last line of defence before playing across to Mane, who makes it 3-1. Man City employed a 4-3-3 formation, switching to 4-1-4-1 in defence, with Leroy Sane and Raheem Sterling dropping into midfield and Fernandinho patrolling behind the line of four. Fabian Delph started at left-back but was replaced by Danilo on 29 minutes. City struggled to impose their usually effective midfield combination play. This image shows how Nicolas Otamendi has to switch the play because he has no passing options in behind the midfield. In their defensive transition, City were slow to reorganise and start pressing in the opposition half. The players nearest to where they lost the ball failed to press the man on the ball properly, despite enjoying numerical superiority around him. Man City surprised the Liverpool defence from attacking set-pieces, most notably with Otamendi. Here, the Argentinian centre-back attacks the gap between Joe Gomez and Firmino to get a header away. Man City did manage to penetrate the last line of a possibly complacent defence in the final few minutes, taking advantage of Andy Robertson’s isolation at left-back to put two goals past the vulnerable Loris Karius. Pep Guardiola employed a 4-3-3 formation, switching to 4-1-4-1 in defence, with Leroy Sane and Raheem Sterling dropping back into a midfield four and Fernandinho patrolling in between the lines. They pressed high up the pitch throughout, with Sergio Aguero often joined by Sane and Sterling in a bid to force the Liverpool back four to play direct. In midfield, however, the visitors failed to press the player in possession with enough intensity to win the ball back. 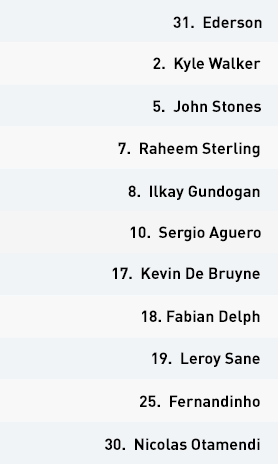 Fernandinho was overrun in this phase, especially in situations where the Liverpool attackers made it in behind Ilkay Gundogan and Kevin De Bruyne. 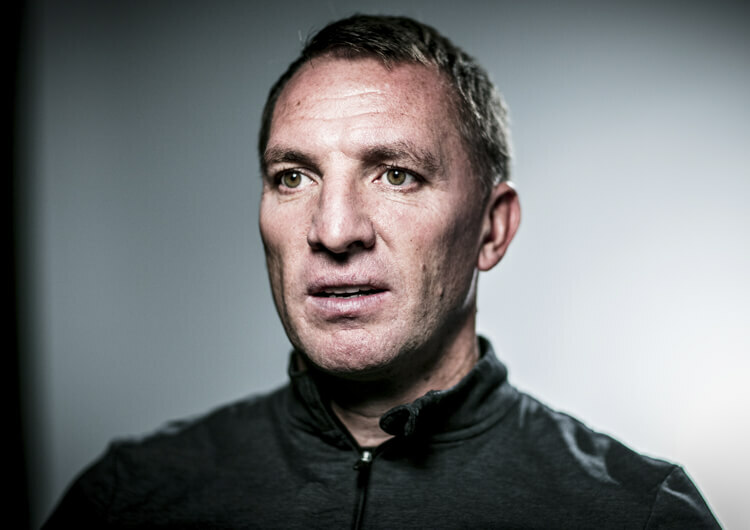 Guardiola struggled to combat the effectiveness with which Liverpool converted their attacking intent in midfield into chances in the final third, where the City defence was easily disrupted and the Reds exposed considerable gaps. 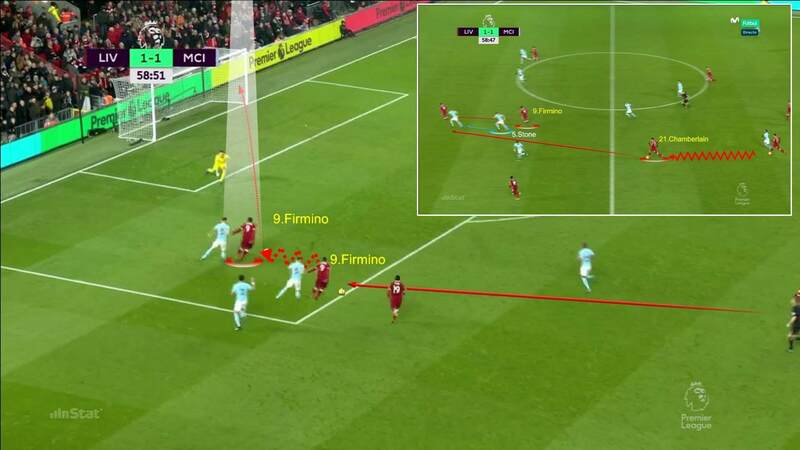 John Stones and Nicolas Otamendi were not able to control the runs that Roberto Firmino made for his teammates, which caused constant uncertainty around Ederson’s penalty area in the second half in particular. In their defensive transition, City were slow to reorganise and press in the opposition half. The players nearest to where they lost the ball failed to press the man on the ball properly, despite enjoying numerical superiority around him. The back four subsequently suffered from a constant threat in behind since they were often stationed at the halfway line. In attack, their combination play was neither consistent nor efficient, their passing dismantled by the rigid, organised pressing from Klopp’s side. The back four were poor in possession, often losing the ball in dangerous positions, as became clear in several of the goals. 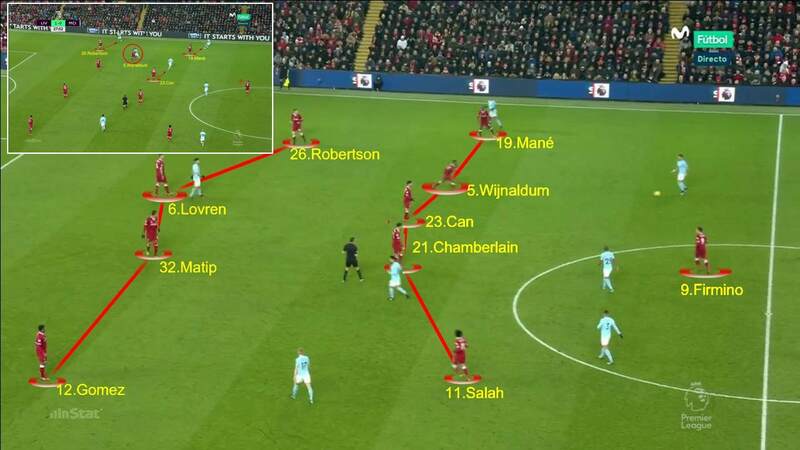 In midfield, they tried to switch the play in order to overcome the Liverpool defensive unit, but the receiver often found trouble in continuing the attack. De Bruyne and Gundogan played too close to the player in possession, making it easy for their rivals to intercept. In the final third, their three forwards failed to create uncertainty in the last line of defence until the final few minutes of the match, when they took advantage of defensive complacency and Liverpool’s weakness in behind Andy Robertson at left-back to put two goals past Karius. On the counter-attack, City failed to disrupt the opposition defence due to the poor positioning of their three attackers. 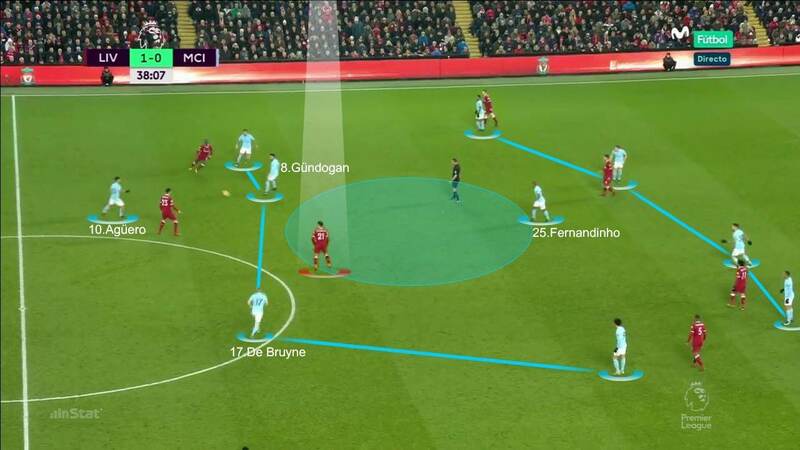 Fernandinho struggled to connect easily with them, while De Bruyne could not make the most of the spaces in the middle of the park behind Can and Wijnaldum. 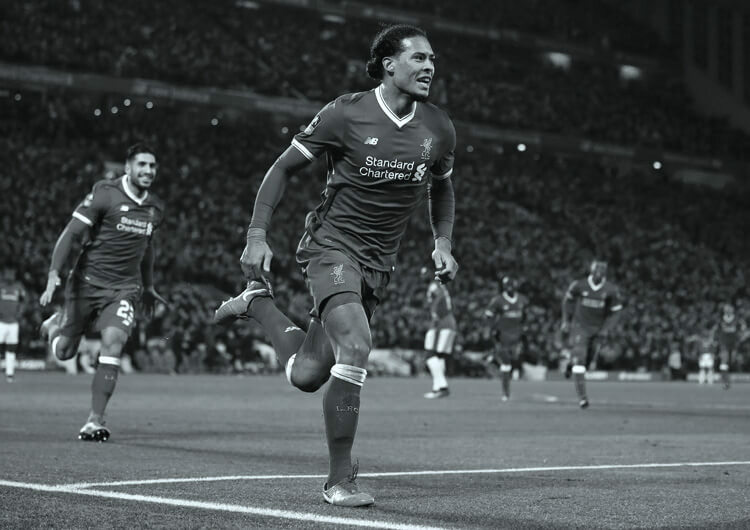 Liverpool dominated the space and tempo in attack, and in doing so were able to exploit the gaps in behind the Man City midfield – especially through Alex Oxlade-Chamberlain. The Reds were at their best on the counter-attack, getting forward quickly and penetrating the empty space in behind the last line of defence. Liverpool forced Man City to play long balls into their forwards. Jurgen Klopp positioned his wingers and central midfielders with a view to limiting the visitors’ possession in midfield. Man City failed to reorganise quickly enough in their defensive transition, leaving them largely unable to cope with the Liverpool counter-attack. 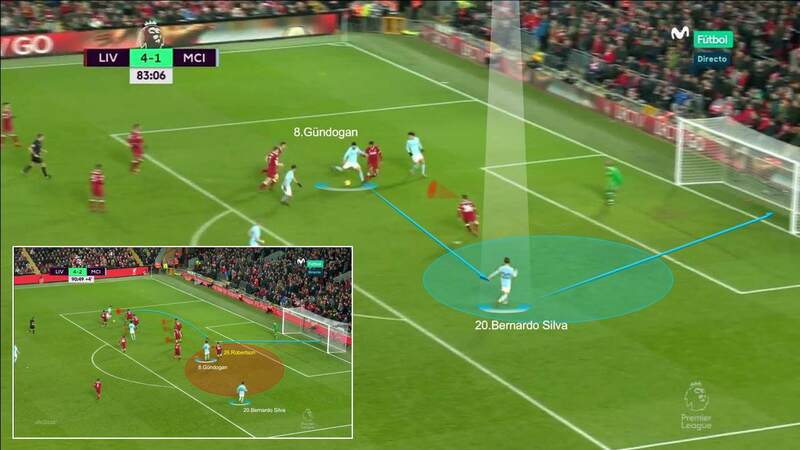 Fernandinho was overrun in the defensive phase, especially in situations where the Liverpool attackers made it in behind Ilkay Gundogan and Kevin De Bruyne. The Brazilian central midfielder was outnumbered and thus failed to offer his team the defensive balance it needed.